Drake's love for his roots run deep and never falters, especially in the wake of tragedy. Saturday (April 14), the beloved Canadian rapper attended the 2018 NBA Playoffs opener between the Toronto Raptors and the Washington Wizards, cheering his home team on as they went on to out-score the Wizards, 114-106. 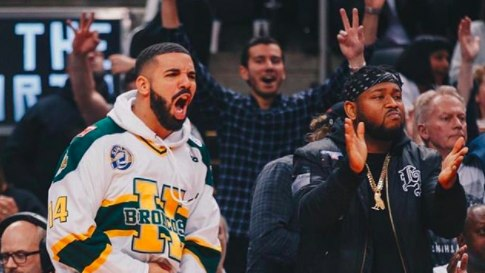 During the game, while sitting courtside alongside fellow Canadian, producer Boi-1da, Drizzy rocked a white, green and gold Humboldt Broncos jersey in honor of the victims who lost their lives when the Canadian junior hockey team's bus was involved in a fatal crash last weekend. Real Talk | Murda Beatz details the "Toronto sound" and why Drake's "Nice for What" is "setting the bar"
The horrific incident, which took place in Saskatchewan, killed 16 people. As reported, the bus was carrying the team to a playoff game when it was struck by a semi-trailer. In addition to Drake showing his support and paying tribute to the victims during the 2018 NBA playoffs, the National Hockey League has issued Humboldt Broncos stickers for all participating players the upcoming playoffs to wear on their helmets, while those across North America are raising money through a viral GoFundMe campaign for the families of the victims. So far, upwards of $11 million has been raised. Take a look at Drake honoring the victims of the Humboldt Broncos junior hockey team bus crash, below. Watch D.R.A.M. crash a swingers party in "Best Hugs"